I always search for ways to improve Blogger Sentral, to make it more visitors and search engine friendly. If you and the search bots are happy with my blog, then I’m happy. One of the things I did was adding a Read-more a.k.a expandable post function. It works fine, but there is one problem–every time I write a new post, I have to insert some codes into the post, otherwise it won’t work. Well, as a self-respecting everything-should-be-automatic-blogger lol, I won't settle for that. I’m determined to find a free solution. Well, yesterday I found it, not another Read-more codes, but a whole template with automatic read-more and automatic thumbnails built in, err make that two templates. Bloggertricks.com has released the new improved version Turn Out Mag & Schemer Mag free premium magazine style templates for Blogger. The two templates were previously released without the auto Read-more and thumbnail functions. The templates are conversions from Wordpress themes designed by ChiQ Montes. The automatic Read-more (or post summary) means you don’t need to insert codes in each of your posts. 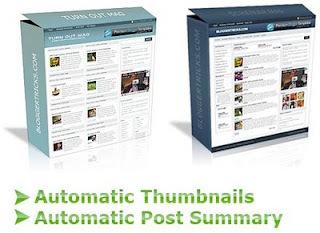 Automatic thumbnails creates a thumbnail for your homepage, to fit in nicely in the post summary. Here are the links for Turn Out Mag Live Demo and Schemer Mag Live Demo pages. 0 comments to "Turn Out Mag & Schemer Mag Blogger templates (with auto post summary)"